Based on a design described in ASTM D 968 and other internationally recognized test standards, the Falling Sand Abrasion Tester consists of an 8" diameter sand reservoir which includes a 60° taper funnel. Standardized abrasive particles placed in the reservoir are released to a guide tube by an abrasive flow gate key. The guide is a 36" straight, smooth-bore tube which contains the abrasive particles as they fall. Specimens are fixed under the guide tube at a 45° angle in a receptacle that includes an opening at the bottom allowing the abrasive particles to be collected in a container. A sturdy base and support system hold the apparatus in a vertical position. Although a variety of abrasive particles have been used, silica sand and various grades of silicon carbide continue to be most popular. To ensure reproducible results, the abrasives must be graded to a particular sieve size. Note: Silica sand is typically characterized by its roundness of grains and produces a slower rate of abrasion on organic coatings. It has been noted that for 3 mil dry film thickness, many of the older coatings would require 20 to 200 liters of silica sand to achieve a failure. Today's more durable coatings may require up to 600+ liters of sand to wear-through. For an extremely durable coating, the Taber Rotary Abraser is preferred as the Falling Sand method tends to be laborious and time consuming with the handling of large quantities of abrasive. Abrasion resistance is often expressed in terms of the volume of abrasive required to wear through a unit thickness of the coating. 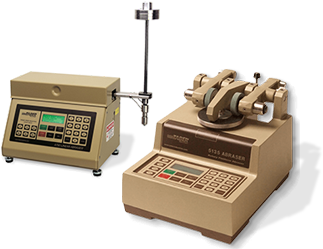 The following link provides a listing of test methods the Taber Falling Sand Tester satisfies. Please note, additional accessories may be required.